Arkle has seen off Desert Orchid and Red Rum to top a poll of the all-time favourite racehorses in Britain and Ireland. The legendary Irish steeplechaser, winner of the Cheltenham Gold Cup three years running, came out top in a vote conducted by the Racing Post newspaper. With dual Gold Cup winner Best Mate looking to emulate him with a third success in March, we look at what made Arkle so popular. One word of two syllables and just five letters, the name Arkle has come to represent the pinnacle of achievement in jump racing. It is 40 years since Arkle won the first of his three consecutive Cheltenham Gold Cups but his achievements have stood the test of time. As well as his Cheltenham treble, he also won the King George VI Chase, the Irish Grand National and two Hennessy Gold Cups. Such was his class that when running in handicaps, he was forced to give away huge amounts of weight - yet still managed to come home in front. In his 34 races under rules, he carried at least 12 stone in 23 of them but finished with a career total of 27 victories. In many races, he would be allotted two or three stone more than his rivals, even though they were top-class horses in their own right. In the 1964 Irish National, the handicappers were forced to draw up two sets of weights - one for if Arkle ran, one if he did not. Arkle had to shoulder at least two stone more than all his rivals. He still won. The horse's phenomenal success came in a career cut short in its prime at the age of nine when he fractured a pedal bone in the King George VI Chase at Kempton. Despite probably incurring the injury early in the race, he battled on and was beaten into second by just half a length. Cheltenham is where true National Hunt champions prove themselves, and Arkle was no exception, fittingly making his (winning) chasing debut there in November 1963. He was back for the Festival the following March where he won what is today known as the Royal & SunAlliance Novices' Chase. The Gold Cup itself was that year won by Mill House and the subsequent rivalry between him and Arkle, billed as a clash between England and Ireland, became one of the most famous of all-time. 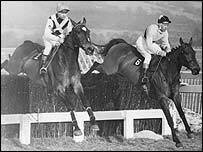 When the pair first met in the Hennessy the following season, Mill House prevailed but Arkle had his revenge in the 1964 Gold Cup. His success the following two years saw him established as a legend at the course, where he is one of just three horses to be honoured with a special statue. And it made him a star not just in the racing world, where he was known simply as "Himself", but beyond. Reports of his races often featured on the nightly news in Ireland while updates on his condition after his career-ending injury at Kempton were carried on the front pages in England. Attendances swelled at meetings where he was running while he received fan mail by the sackful - some of it addressed simply to "Arkle, Ireland" or when he was recuperating after his injury in England, "The Champion, Kempton". Arkle ran his last race in 1966 - it was hoped he would recover enough to race again but he was officially retired in 1968. He spent his retirement years at the Irish home of his owner, Anne, Duchess of Westminster, but advancing arthritis led to him being put down in 1970. Arkle remains the last horse to have won three consecutive Gold Cups. And he still holds the course record at Sandown, where in the 1965 Gallagher Gold Cup under a weight of 12st 7lb, he somehow slashed 17 seconds (roughly the equivalent of 65 lengths) off the old mark. His grave is marked simply "Arkle". For the greatest ever steeplechaser, no further words were necessary.